If you haven’t already heard the name Carson Brown, there’s a good chance you will in the near future. 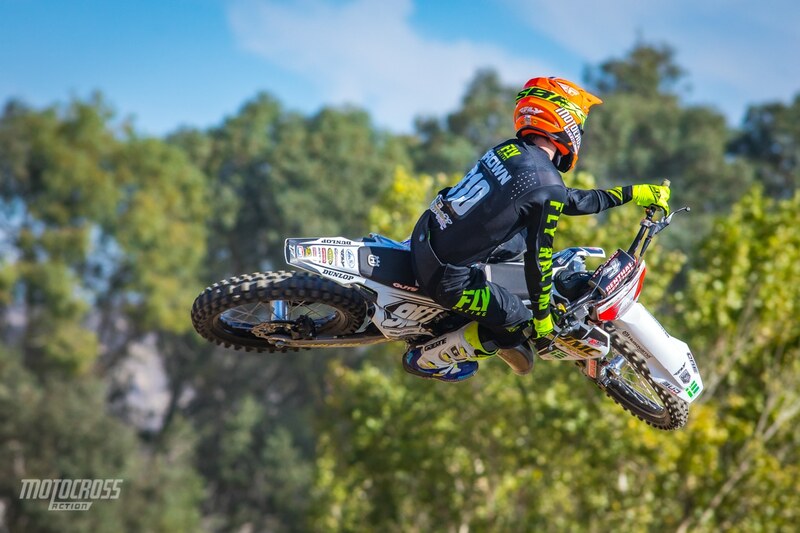 He is currently getting his feet wet in the 2019 AMA 250 West Supercross series (he has four top 20 finishes so far in 2019). 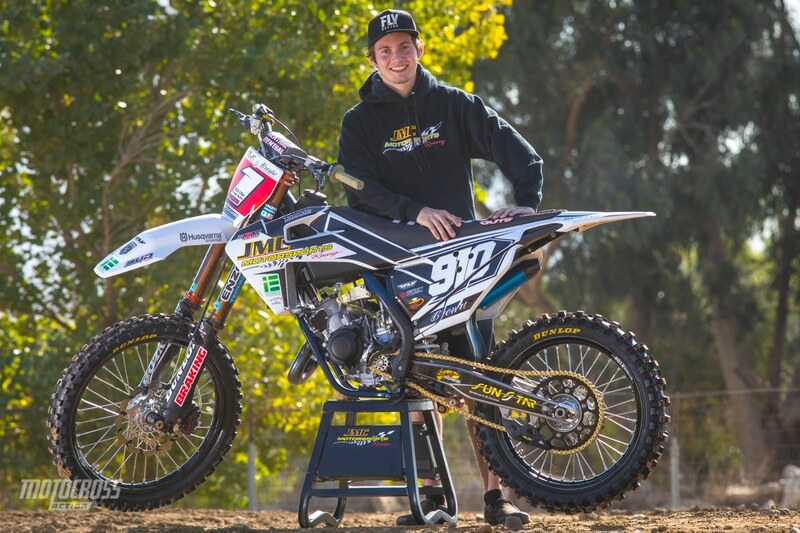 This is his first year in the Supercross limelight, but he already has a few claims to fame. Carson has built a reputation as the “King of Pit Bikes.” He just might be the fastest pit bike racer on the planet. That status doesn’t pay the bills; however, it is part of the Brown family legacy, as his dad and uncles are the owners of BBR Motorsports. They singlehandedly invented the exotic pit bike business—before it was ruined by Chinese knock-offs. We covered many BBR builds back in the day when Carson was just a kid. Now, Carson is 19 years old and ready to hit the big time. THE STRAIGHT RHYTHM ALLOWED UP TO 150cc OF DISPLACEMENT. CARSON AND THE JMC CREW DID NOT WANT TO LEAVE POWER ON THE TABLE. 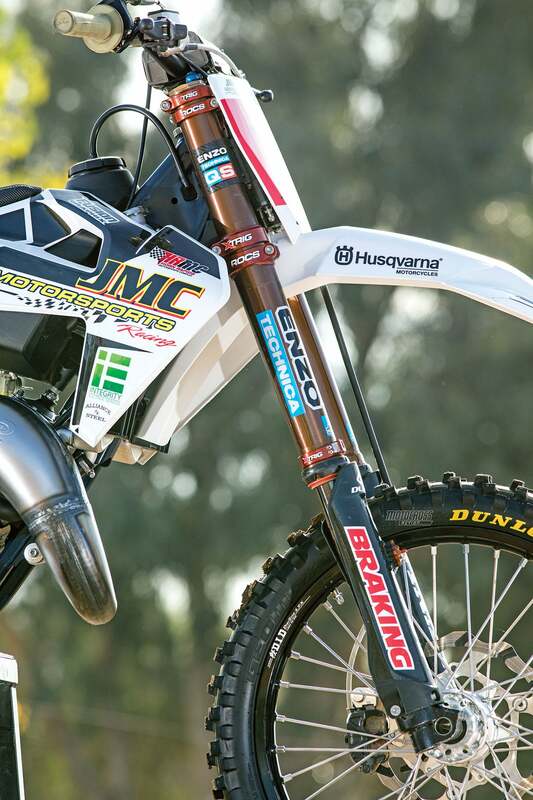 SINCE JMC MOTORSPORTS IS A HUSQVARNA DEALER, THEY STARTED WITH A FRESH 2019 TC125 AND USED A HUSKY 150cc KIT, WHICH IS ACTUALLY 144cc, THAT BOLTED RIGHT ON. Even though Carson Brown has a big following in the motorcycle industry, he is an underdog in the AMA Pro Supercross community. We love underdogs, but they usually have it rough. Underdogs struggle to make ends meet chasing the dream. But, Carson is different. First of all, he is more than fast enough—but at a disadvantage on an AMA Supercross track because he has no practical experience. Working in his favor is that he is friendly and outgoing, while many too-hip young riders are social cripples. He is determined, talented, works hard, knows how to test and is smart! So, why isn’t he already on the tips of the motocross elite’s tongues? Our guess is because he lives in Washington—and doesn’t spend much time in SoCal, Florida or Texas. Carson isn’t where the talent scouts’ eyeballs are. THE GEAR: Jersey: Fly Racing Lite Hydrogen, Pants: Fly Racing Lite Hydrogen, Helmet: Fly Racing F2 carbon, Goggles: EKS Brand Premium, Boots: Gaerne SG-12. Enter JMC Motorsports from Pasco, Washington. They fielded a 250 Supercross team for both coasts in 2018, and when they went looking for prospects for their 2019 roster, Carson was the biggest dot on their radar. 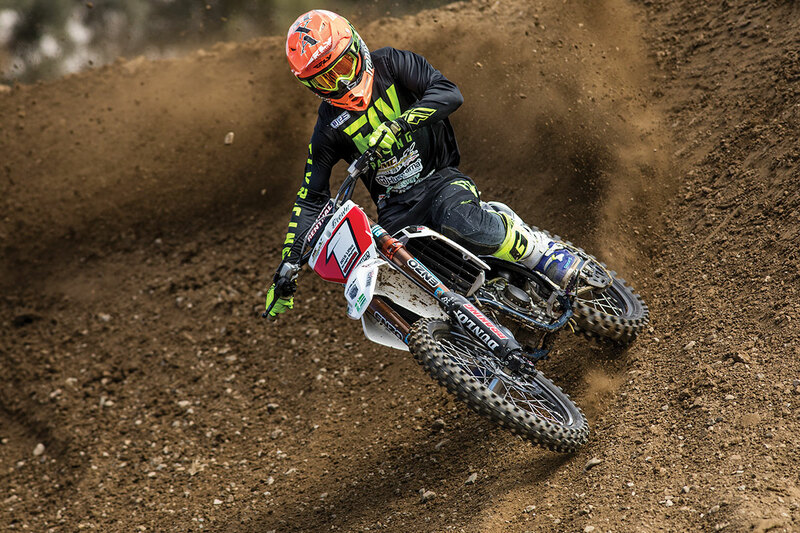 They knew Carson was a two-stroke aficionado and had marksman-like skills, so they proposed a plan to build him a bike to race the 2018 Red Bull Straight Rhythm in the 150cc two-stroke class and signed him for the 2019 AMA 250 West Supercross season. Carson was in, just as long as they built him a true-to-life Supercross-style 150cc race bike to his liking. JMC went full Monty. 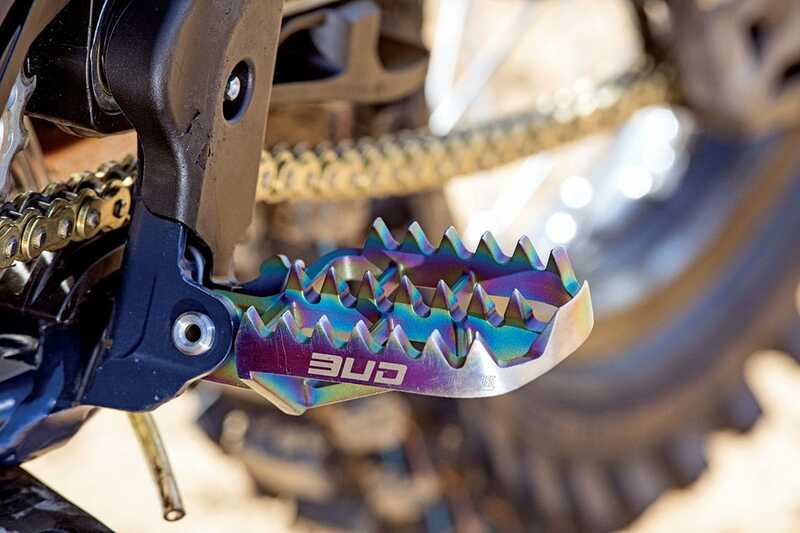 The Bud Racing titanium footpegs are a thing of beauty. At the 2018 Red Bull Straight Rhythm, Carson was a revelation. The JMC-built TC150 was the perfect package for Carson to beat out every rider in the 150cc field and win the crown. After the race, Carson’s dad, Duane, asked if we wanted to ride Carson’s winning machine. The rest is history. 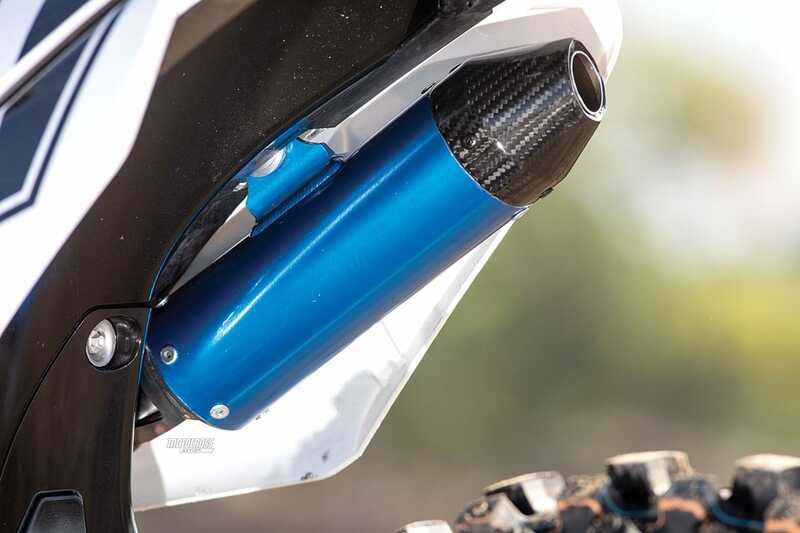 The Bud Racing silencer was cut down two inches to access more bottom-end power. The Brembo works brakes had great modulation. JMC Motorsports built this bike in-house and spared no expense. They outsourced the cylinder to Mitch Payton at Pro Circuit, the crankshaft to Falicon and the tumbled and cryogenically frozen transmission to Cryo-heat. They traded the WP 48mm AER air forks in for Kayaba SSS units with subtanks and used a WP Trax shock. Both were set up by Enzo. This was the fastest 150cc two-stroke engine we have ever ridden. We weren’t surprised. Mitch Payton ported the cylinder himself. The Straight Rhythm allowed up to 150cc of displacement. Carson and the JMC crew did not want to leave power on the table. Since JMC Motorsports is a Husqvarna dealer, they started with a fresh 2019 TC125 and used a Husky 150cc kit, which is actually 144cc, that bolted right on. It includes a head, cylinder, piston, rings, gaskets, ECU, wrist pin and power valve, all for $799.99. The kit has been tested by the MXA wrecking crew and is great if you are looking for added boost. Carson ran Kayaba forks instead of WP air forks. Enzo built the forks with sub tanks behind the number plate. All the engine bearings were replaced with ceramic bearings from Worldwide Bearings. This is no cheap upgrade. Ceramic bearings are around three times more expensive than steel bearings. Are they worth it? They are stronger, lighter, more precise, do not need lubrication and do not rust like steel bearings do. When it comes to producing power, the price of the bearings and rebuilding the engine isn’t worth the small power gains for your average Joe. But, for a 125cc tiddler that needs all the power it can get for a Supercross-style track, a half-horsepower gain is worth the expense. MXA spent a lot of time adjusting to the switch from Keihin to Mikuni when KTM and Husky dropped the Keihin in 2016. 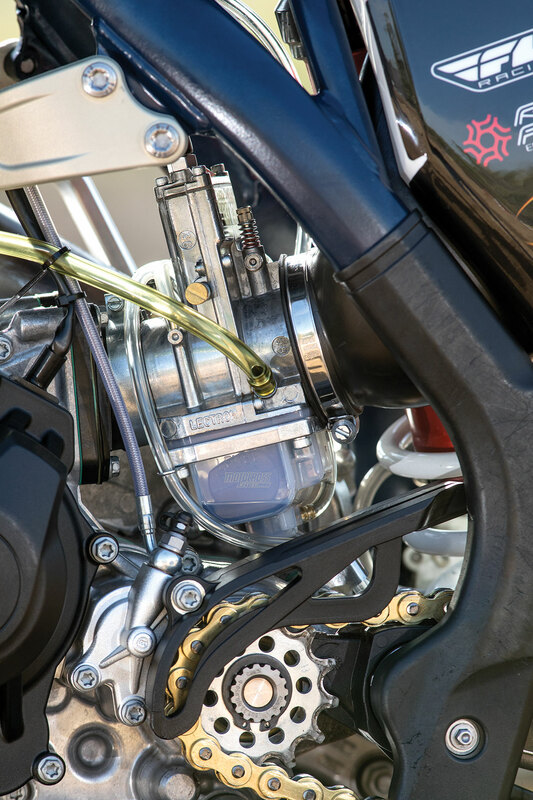 For 2019, we will say you don’t need a box of brass for the Mikuni to run clean. 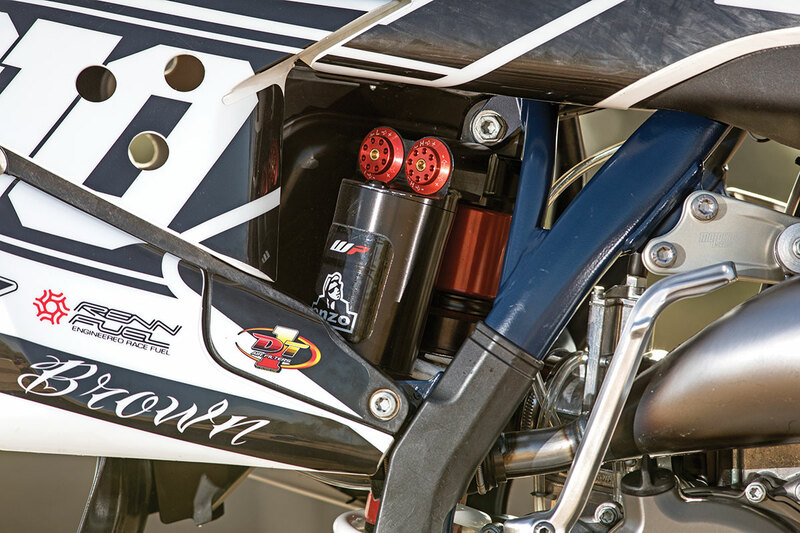 Carson and the JMC crew had no issues with the Mikuni TMX but wanted more top-end power. This search led them to a 38mm Lectron carburetor. The power was less in the low-to-mid part of the powerband, but Carson didn’t care; the Straight Rhythm was all about peak power. Bolt-on power for the TC150 included a Rekluse Torq-Drive clutch, Vortex ignition, and HGS/Bud Racing pipe and silencer. JMC cut the silencer 2 inches to contour the power to Carson’s likings. A longer Pro Circuit link arm was used. 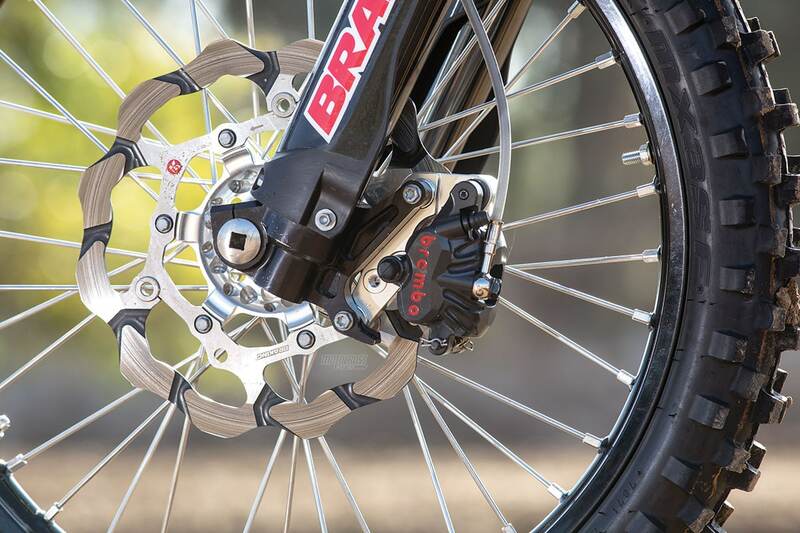 Other parts worth noting are the Brembo factory calipers (front and rear) with the front caliper mated to a 270mm Braking front rotor, Mettec titanium axles with the rear being a Honda axle that was adapted with Ride Engineering axle blocks, and trick Bud Racing titanium footpegs. OF NOTHING BUT HARD HITS. For a Supercross race that only goes straight, Carson ended up running much more sag than normal (120mm to be exact) and a super-stiff setup to help get him down a track that consisted of nothing but hard hits. 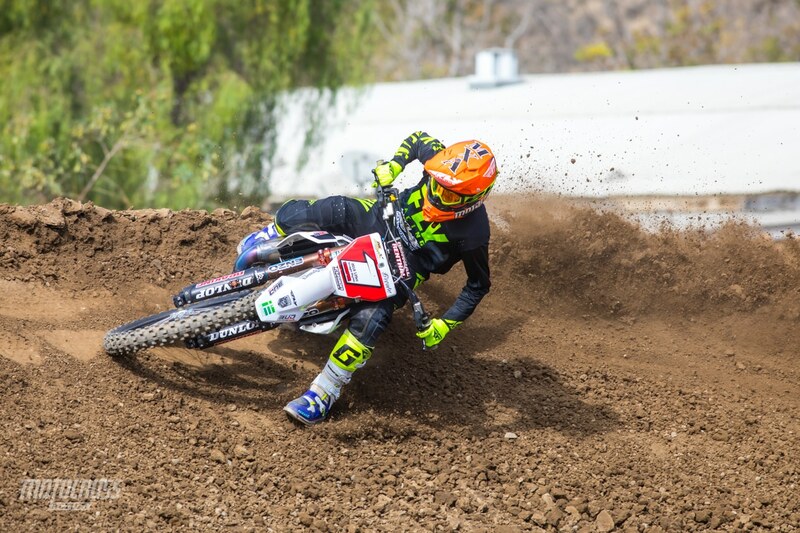 MXA’s test riders were shocked at just how stiff the setup was. The shock barely moved, but the choppered-out setup got the power to the ground. Surprisingly, it didn’t feel horrible in the corners for the MXA crew, but the only corner Carson Brown made at Straight Rhythm was when he pulled off the track. 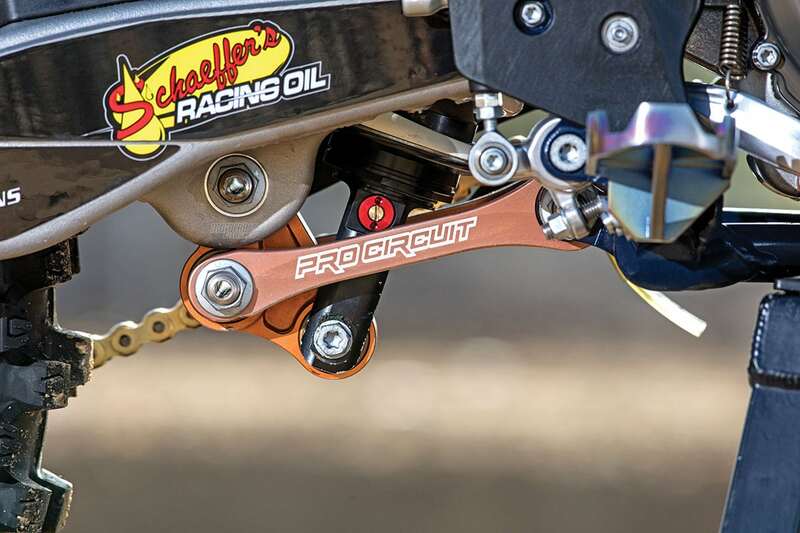 The WP Trax shock’s dropout feature was turned off, which is not unheard of, as Ryan Dungey had his turned off most of the time. The drop-out feature extends the shock towards the ground whenever the rear wheel is not under a load. It is a unique feel that can be hard to get used to. Overall, the bike handled fairly well on a regular Supercross track, considering what it was designed for. A Lectron carb was used as it produced more peak horsepower. The engine was incredibly fast. Carson believes that if he could get a decent start at an AMA 250 National on his JMC Husky TC150, he might just do better on it than on his 250 four-stroke due to the bike’s potent power and agile handling. 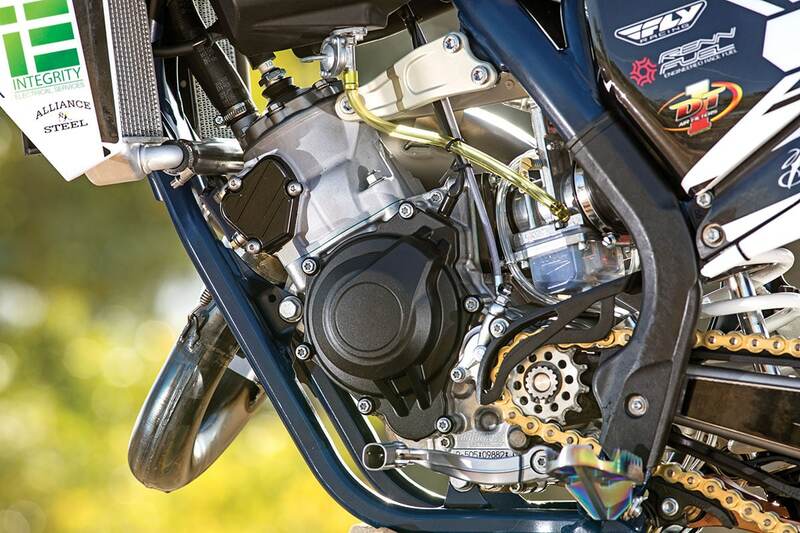 As it sits, Carson’s bike pushes 45 horsepower at the rear wheel, and we could feel it; however, we couldn’t just chop the throttle because this engine had zero low-end power. 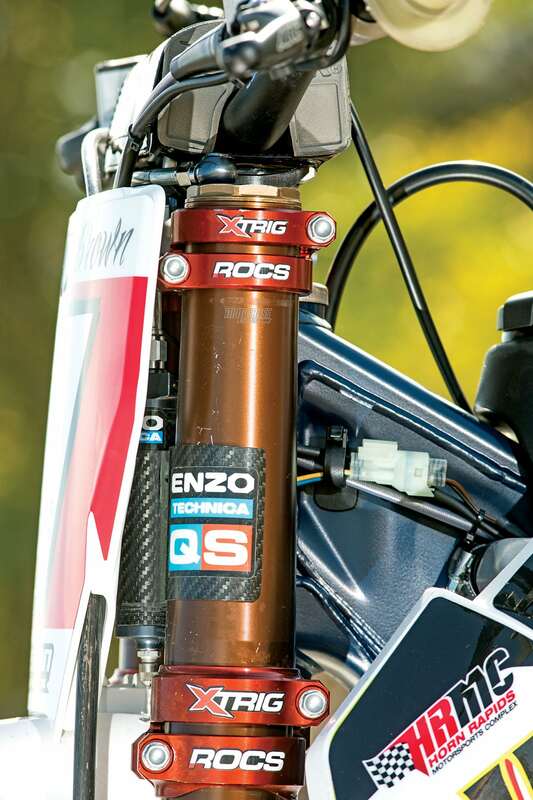 Luckily, its powerband isn’t razor-thin like the old-school 125cc factory bikes of the past. It had some volume to the power, as it screamed bloody murder from mid to top. But, it only worked if you held it wide open—not some of the time, all of the time. And when you did, it had a scary lean pop. When we asked about richening it up a little, JMC said that Carson insists on running super-lean jetting. He says it runs best when it is on the edge of being too lean. You don’t have to be a rocket scientist to know the leaner you go, the faster and crisper the bike will be, but for that reward there is risk. Carson likes to live on the edge. THIS IS THE FASTEST 150cc MACHINE WE HAVE EVER RIDDEN. IT IS A 250 FOUR-STROKE FIGHTER; HOWEVER, WE THINK $20,000 IS A LOT OF MONEY TO DUMP INTO A BIKE THAT DOESN’T HAVE MUCH OF A PURPOSE IN THIS FOUR-STROKE WORLD WE LIVE IN. This is the fastest 150cc machine we have ever ridden. It is a 250 four-stroke fighter; however, we think $20,000 is a lot of money to dump into a bike that doesn’t have much of a purpose in this four-stroke world we live in. 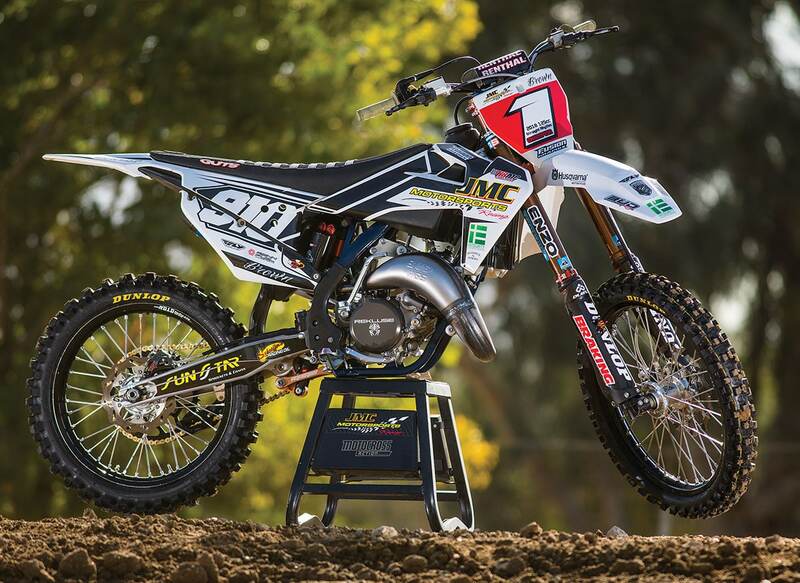 This bike was built for one specific task—to win the Red Bull Straight Rhythm. To JMC Motorsports and Carson Brown, it was well worth the dough to pull off the win.